Tell everyone you know about our fantastic live music night, and bring your family and friends! Come along on the 24th November 2012, singalong or request a special song! Meet local people, enjoy socialising and make some new friends! Enjoy some foot tapping fantastic live music, provided by members of your local community in a warm and friendly atmosphere! Chat away over a coffee, some mulled wine and a slice of the yummiest Xmas cake ever! Come along and enjoy the fantastic festive atmosphere and music! 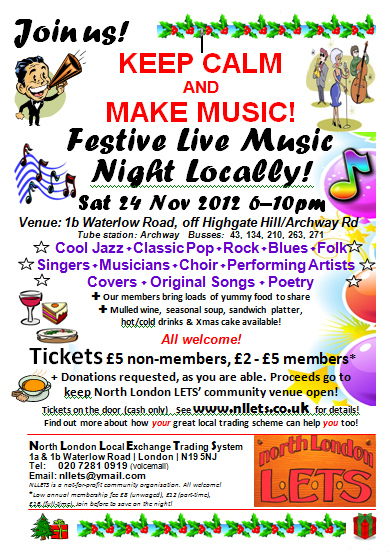 Being here means you can also help your local community organisation North London LETS to keep our community events premises open. Proceeds go to towards covering our running costs, and making it easy for local people to continue helping one another. We look forward to your company on the night!